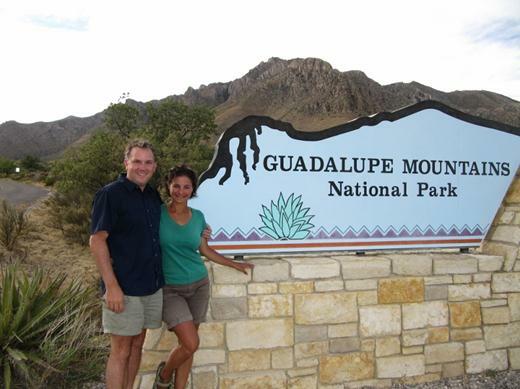 Our next stop was the Guadalupe Mountain range near the New Mexico border. In this picture is El Capitain. 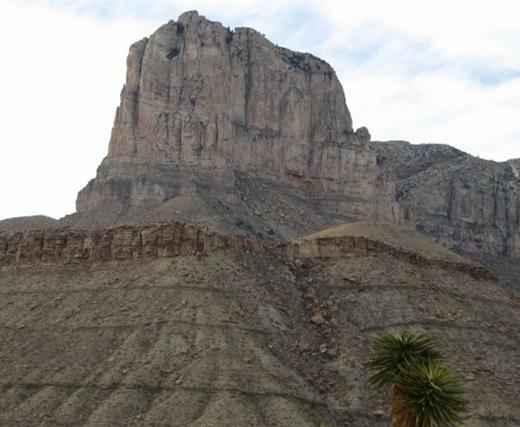 Right behind it is the highest peak in Texas at a whopping 8,749 feet above sea level. We checked out the park’s camping facilities. 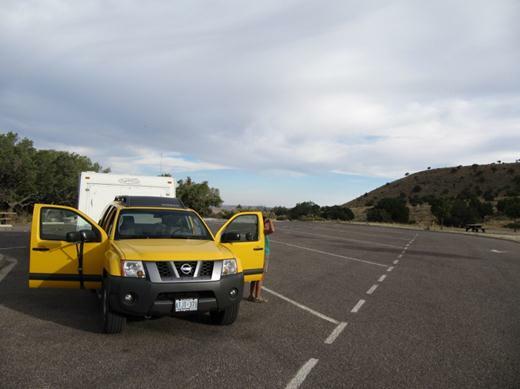 The RV and Trailer campsites are essentially a parking lot. This particular site was only $8 per night but had no electricity or water – that meant no air conditioner and it was hot out! 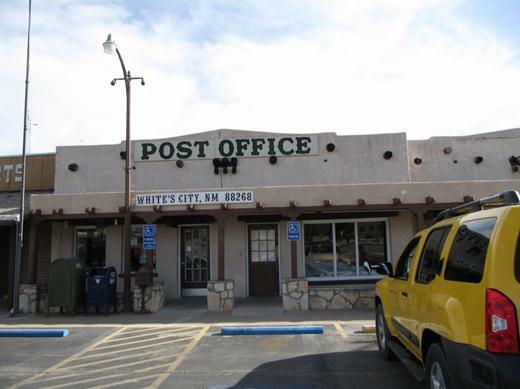 So we decided to head over to White’s City – according to their website they are the closest campground to Carlsbad Caverns and offer electrical sites for only $6 a night. 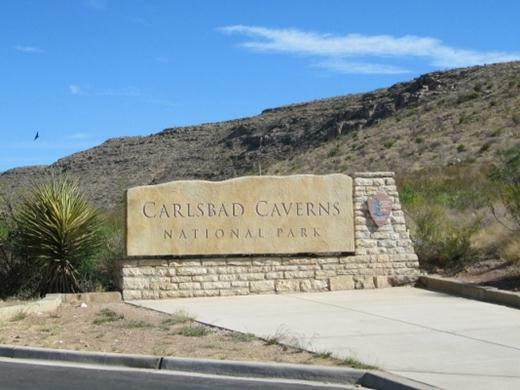 White’s City was named after Jim White – the man that discovered and promoted Carlsbad Caverns. 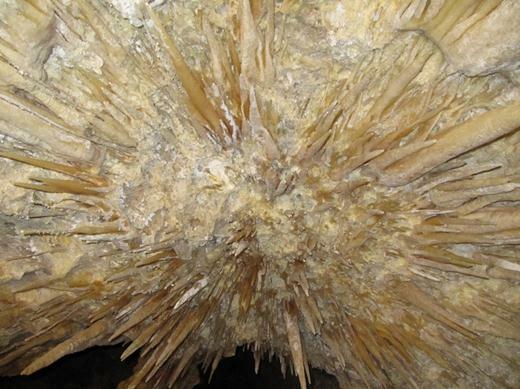 The city is in fact the closest spot to Carslbad Caverns. But the campsites were about $40 a night and not particularly inviting (or as Jason called it “a dump”). We decided to move on to Carslbad (the city). We found a premium spot there for $37 a night. 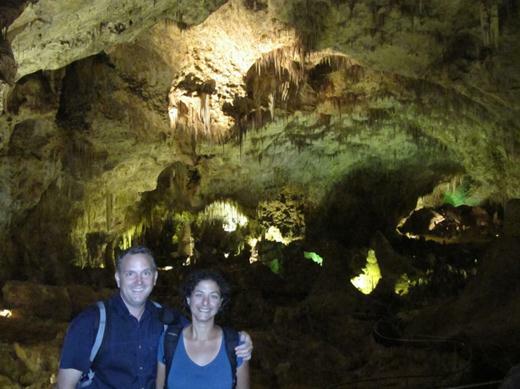 The next morning we headed to Carslbad Caverns. 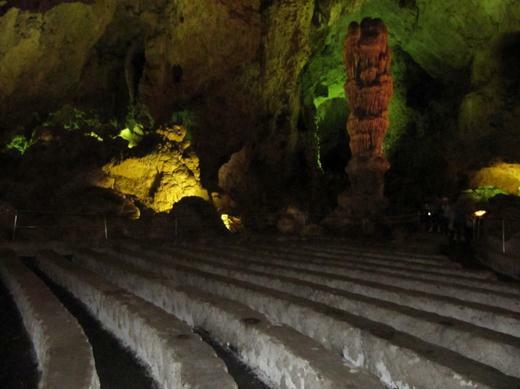 The main caverns are 750 feet below the ground. 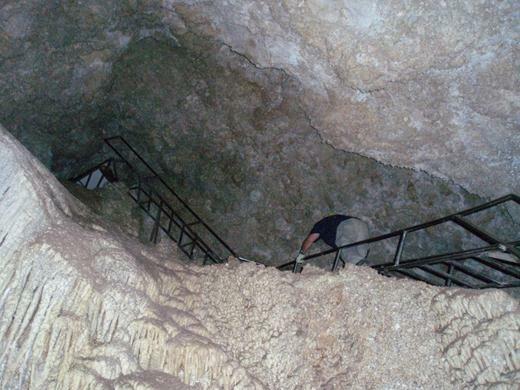 There are two ways to reach them – by elevator or by hiking down. For our first descent we decided to hike down. 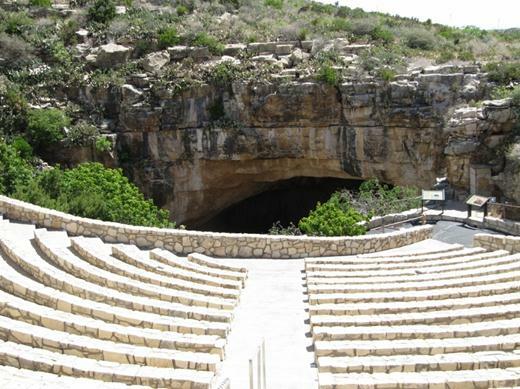 The path starts at this amphitheatre. 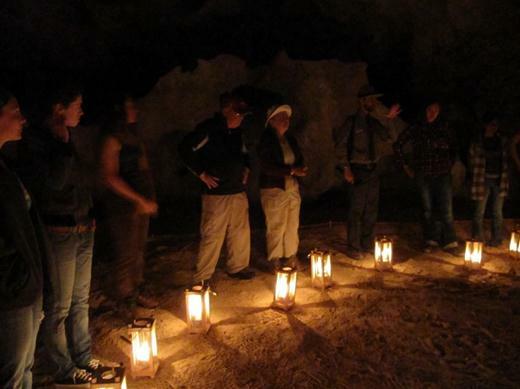 From mid-May to October thousands of bats fly out of the cavern mouth and swirl up into the sky at sunset. 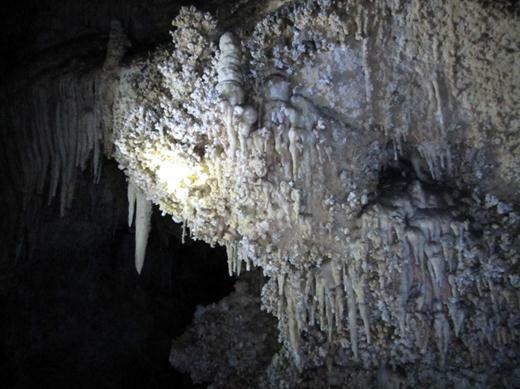 The swirling bats are apparently what first brought Jim White to these caverns. There were lots of things to see as we headed down. This formation is called whale mouth. 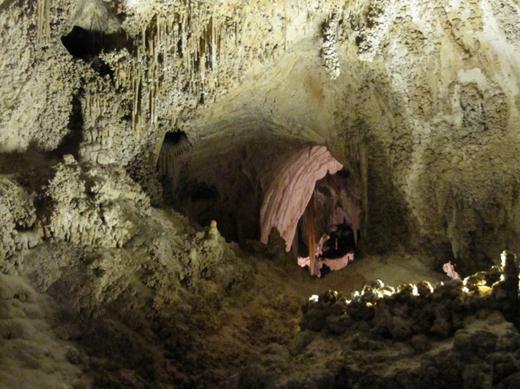 Each formation is considered a decoration in the caving world and Carlsbad Caverns’ is a highly decorated cave. Plain old rocks like these are not considered decorations but still make for neat viewing on the hike down. 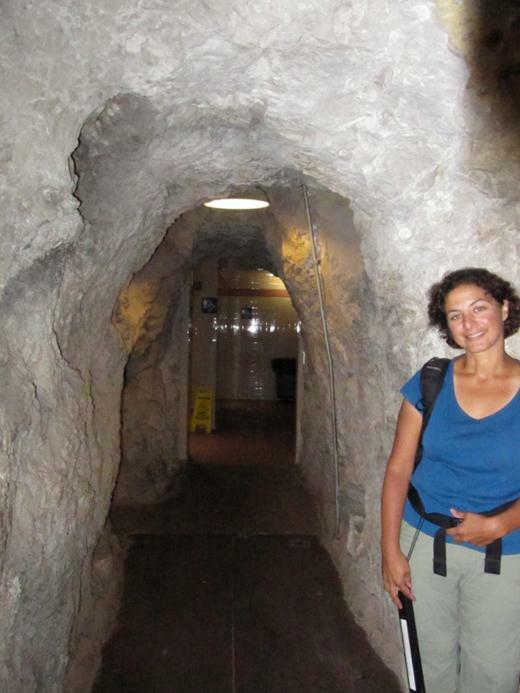 We spent hours touring through the Big Room – a cavern that is about the size of 14 football fields. This is just one area of the Big Room – to give a sense of size. The Big Room is big enough to have its own amphitheatre. 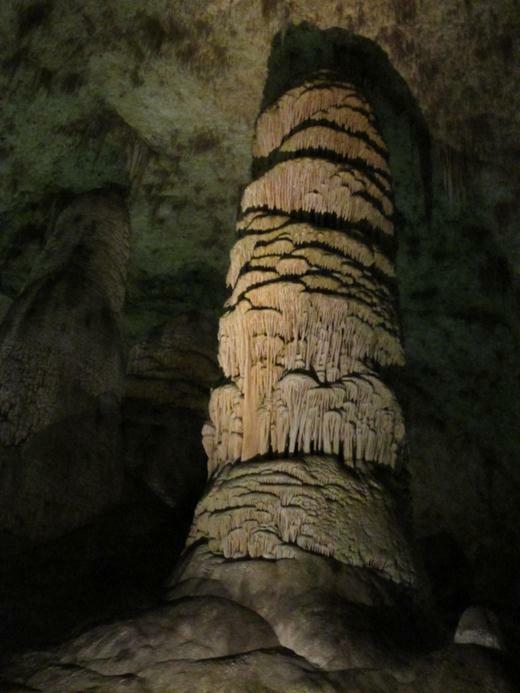 Many of the Stalagmites (formations that starts on the floor and reaches up to the roof) were very tall! 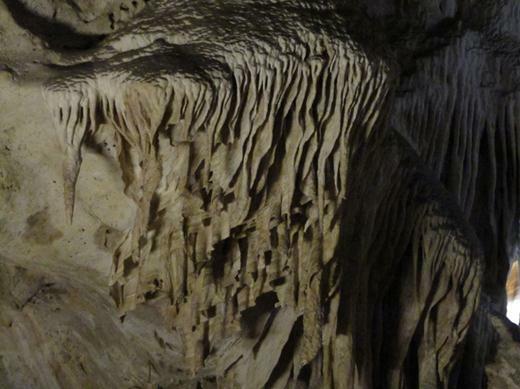 This picture shows Draperies – a formation that result from drips coming down from the roof. 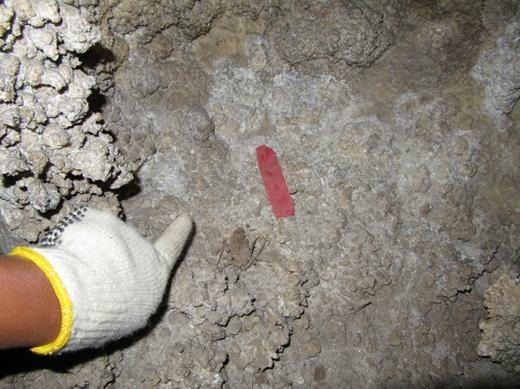 This picture shows Soda Straws (another type of roof drip formation). 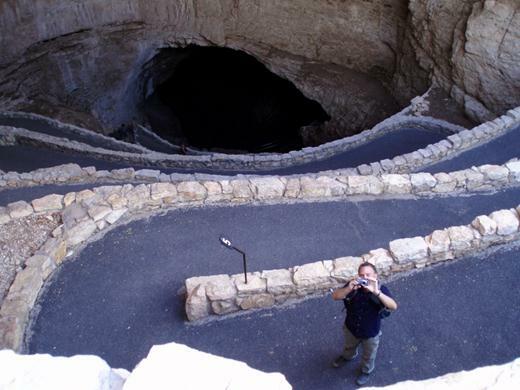 Wow – that ladder is how the early visitors taking Jim White’s tours would go down into the lower caverns. The lighting was amazing. 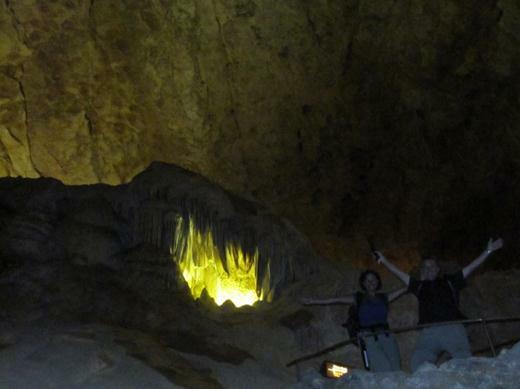 A theatre lighting specialist set out the lighting for the cavern using approx. 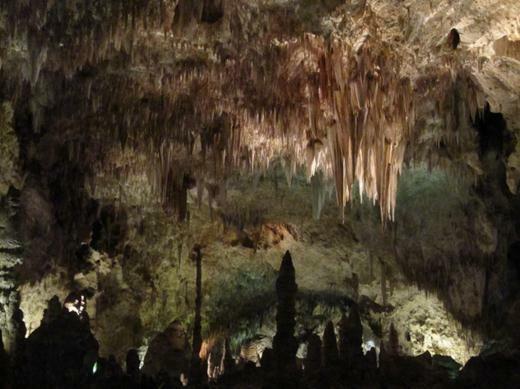 1,100 light bulbs to show off the formations. In the afternoon we went on the Ranger led hike called King’s Palace. 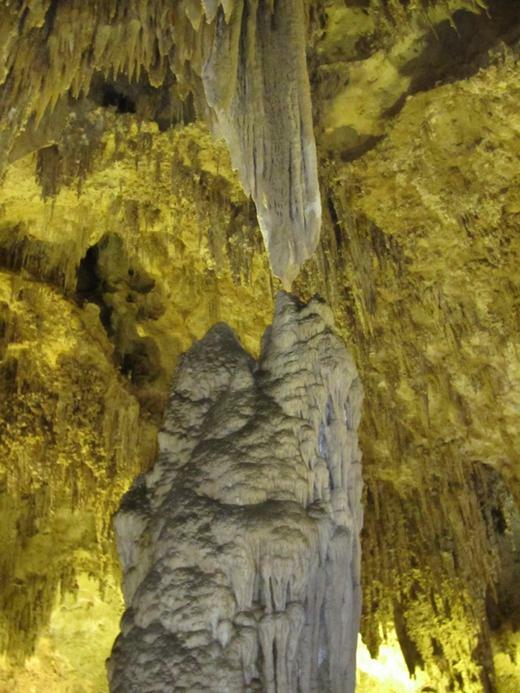 We took tons of pics on that hike but this one takes the cake – a stalagmite and a stalactite (another roof drip formation) are so close they look like they’re kissing. The next day we were back for the Ranger led Left Hand Tunnel hike. 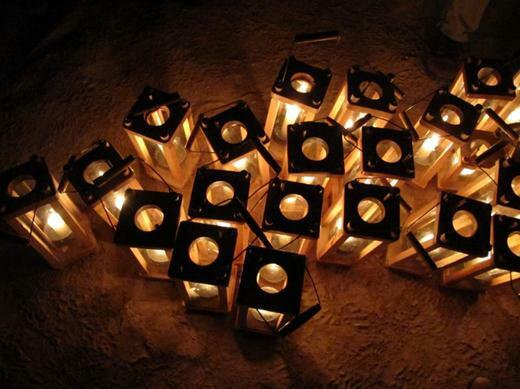 This hike mimicked the early days with each person carrying a candle lit lantern. It’s amazing how much light a candle can provide in a completely dark space. In this pic we’re just about to blow out all the candles and experience absolute, complete darkness. 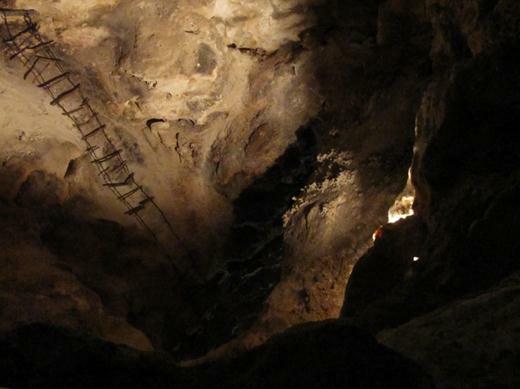 Then climbs down three ladders – each is longer and steeper than the one before it. 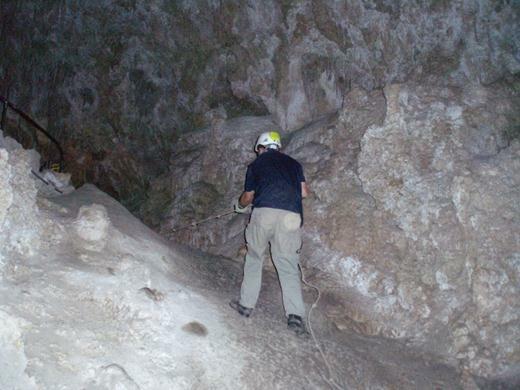 We had to be really careful ’cause one slip and you could fall down several stories or slip into a crevice. 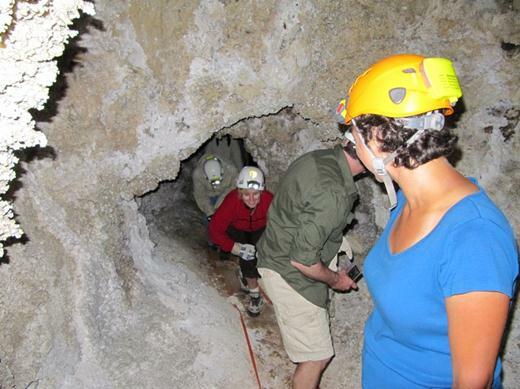 Then we went through narrow spaces. 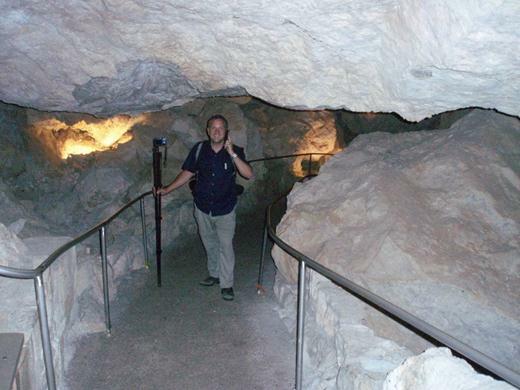 In this pic our Ranger shows us how to navigate without touching the decorations. That’s Marianna in the blue t-shirt. 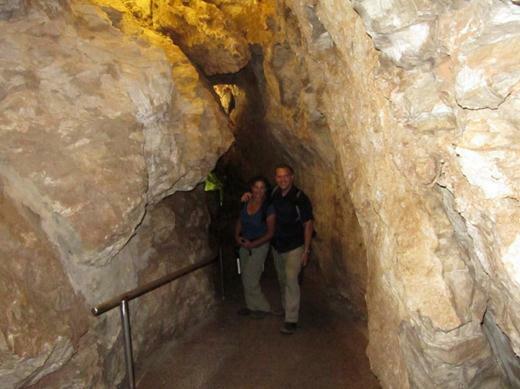 More narrow spaces – we’re following the original National Geographic survey route. The only light is from our helmets. 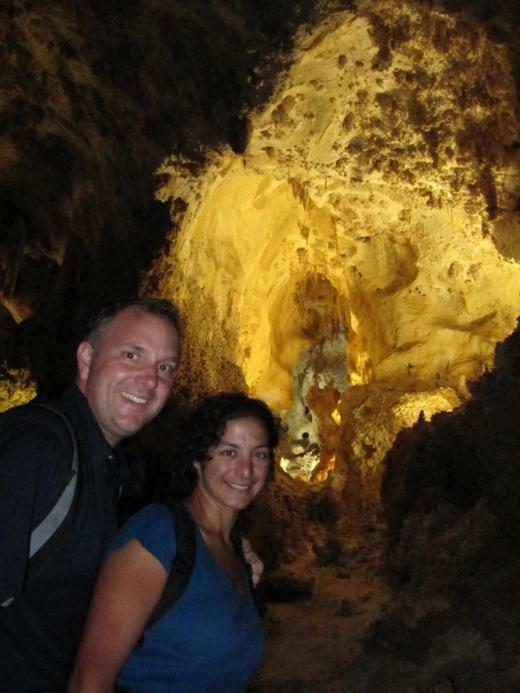 These two people behind Marianna are from Hamilton, ON! 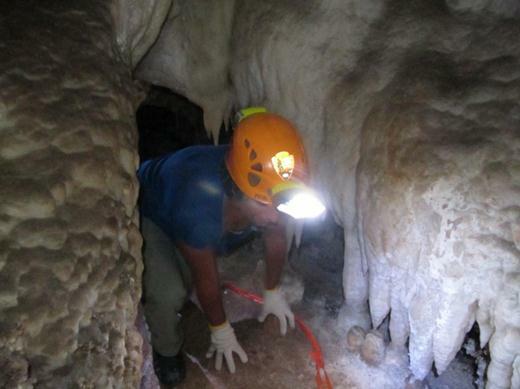 Check out this preserved bat – it’s been dead for hundreds of years. This one was very cool. 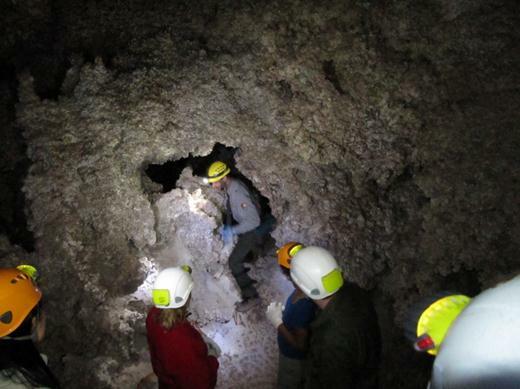 A bat died hundreds of years ago on this stalagmite but the formation kept growing and eventually buried the bat inside!!! After two days of caving we decided it was time to spend some time focusing on the sky – off to Roswell, NM in search of alien life! All I can say is unbelievable! These pics are just stunning, so fantastic the look of everything ..and no way would I have done that with those old ladders..crazy! Once again you two are hitting all the “high” spots on earth what a joyful education. Can’t wait to see Roswell.